Eric and Antoinette Lindberg came to UCLA in June for the birth of their first child, but they never imagined they might be part of the historic move to the new hospital. As it turned out, their daughter, Annika, was the last baby born at the old UCLA Medical Center. While the Lindbergs were aware of the upcoming move, “I always believed that this baby was going to come early, so I thought I’d be well clear of the moving date,” says Antoinette. “I was wrong.” Her obstetrician, Dr. Jeannine Rahimian, felt that the baby might, in fact, be the first born in the new hospital. “I wasn’t thinking that she would be the last one born in the old hospital!” Dr. Rahimian says. The couple considered inducing labor to avoid delivery while the move was going on, but it wasn’t the right time. “So we sat and looked at each other in the waiting room and realized that our baby was probably going to come at the most-inconvenient time possible,” Eric says. 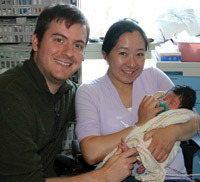 Sure enough, at 10 p.m. on June 28 - seven hours before the move was to begin - the Lindbergs arrived at UCLA Medical Center for the birth of Annika. Antoinette had already been in labor for 24 hours, and it would be another nine-and-a-half hours before the baby was born. “The baby didn’t arrive by the time we were supposed to leave, so we stayed after the others had left,” says Dr. Pamela Boyer, the obstetrician on call. Postscript: The first baby born at Ronald Reagan UCLA Medical Center, Antonio Ronald Morales, 6 pounds and 8 ounces, arrived at 2:28 p.m. on June 29. Antonio and Nancy Morales of Los Angeles gave their first-born child the middle name of Ronald in honor of President Ronald Reagan, the namesake of the hospital where the baby was born. LAST BORN : Annika Lindberg with parents, Eric and Antoinette. FIRST BORN: Antonio Ronald Morales and mother, Nancy.